Posted on 05 Mar 2016. "...a band to watch out for, all musicians showing authority and sophistication in their playing and a great selection of material. Duke for modern times." I can't wait to share the music with you later in the year, but for now would like to say a huge thank you to ARTS COUNCIL ENGLAND for supporting and believing in the project. 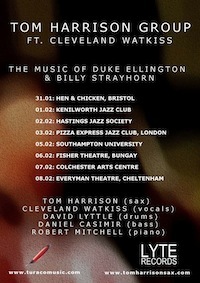 The group features an all star cast of British jazz musicians each defined by their unique voices as performers, who work together to not only interpret the music of Ellington, but transmit the joyful spirit of the dancehall music and Duke Ellington's legendary stage presence. Tom Harrison: For alto saxophonist/composer Tom Harrison, the art of jazz is far more than mastery of the instrument, fluency in the repertoire and respect for the tradition. For Tom, the real undertaking is to connect with that which inspired the immortals of jazz, and to cultivate it within his own work. Since graduating from the renowned Trinity College of Music in 2012, Tom Harrison has performed or recorded with a host of internationally recognised jazz musicians in 12 countries, including Terell Stafford, Joe Lovano, Jason Rebello, Michael Buckley and Jean Toussaint, as well as commercial artists such as Heather Small, M-People, Talib Kweli and The Fall. His debut album was well received by the media, described as "impressive" by Jazzwise and "a strong calling card" by All About Jazz. The album was launched with a 22-date UK tour, featuring a series of guest tenor saxophonists including Jean Toussaint and Paul Booth. Cleveland Watkiss: Featuring prominently in the group is internationally renowned vocalist Cleveland Watkiss. 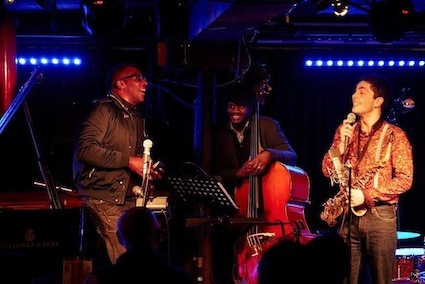 Described by The Evening Standard as "The best male vocalist in Britain," Cleveland Watkiss won the London Jazz Award for Best Vocalist in 2010, and was voted Wire/Guardian Jazz Awards best vocalist for three consecutive years. Watkiss was born in Hackney, East London, to Jamaican parents. Watkiss was one of the co-founders of the vastly influential Jazz Warriors big band. His vocals can be heard on their debut album, Out of Many People. Watkiss has performed with a diverse range of artists from around the world, including: the Royal Philharmonic Orchestra, Wynton Marsalis & JALO, Bob Dylan, Art Blakey, Abdullah Ibrahim, Stevie Wonder and many more. Robert Mitchell: In the early 90s, Robert Mitchell began to emerge as an important member of the London scene with two groups Quite Sane and Tomorrow's Warriors. Poles apart in their music and purpose, the diversity foretold Robert's wide-angle view of Jazz expression. This quickly led to further involvement internationally with Steve Coleman, Greg Osby, Courtney Pine and Steve Williamson. Over his nearly 20 years entrenched in the art of music, Robert has recorded eight albums of his own projects, participated in over 100 projects as a sideman and has performed in more than 40 countries. David Lyttle: David Lyttle began performing professionally at the age of four in his folk group the Lyttle Family, playing bongos, bodhran and mini lambeg drum. At eight years old he added drum kit and by ten years old he was also studying cello and uillean pipes. At eighteen he began focusing on the drum kit after taking an interest in jazz. David first reached a national audience with jazz guitar legend Louis Stewart in 2006. 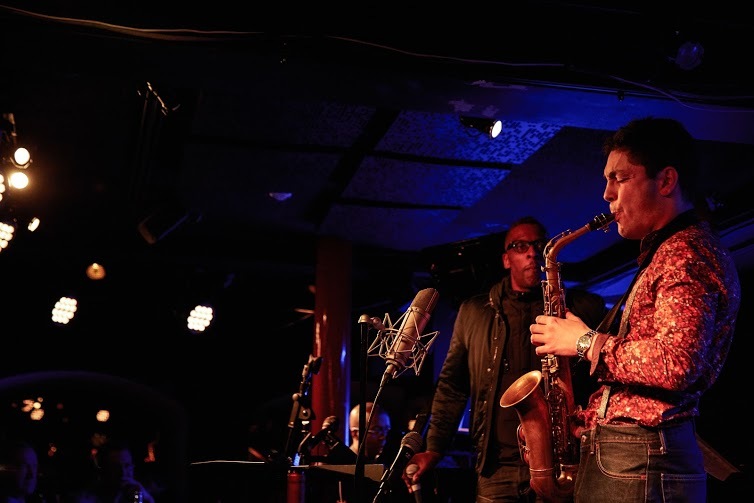 Over the next five years would feature a long list of international jazz icons in his touring bands, including Greg Osby, Soweto Kinch, Terell Stafford, Jason Rebello and Jean Toussaint. Since then, David has performed in over 20 countries. His MOBO nominated album 'Faces' featured collaborations with internationally recognised music stars, including Joe Lovano and rapper Talib Kweli. Rolling Stone magazine described Faces as "sophisticated and sharp...one of the best, robust listening experiences you're likely to have all year."